Your Grace is Sufficient: Who are you to Judge? One of the most oft-quoted and certainly misquoted phrases of our Holy Father, must certainly be the one he made in one of his signature off-the-cuff interviews with the media, “Who am I to judge?” It was splashed in headlines across the world, with the additional commentary that Pope Francis had now given his papal approval to homosexuality. The media coverage on the recently concluded extraordinary synod of family, which hinted that the Church was on the verge of doing just this, did not help. Of course the real context of the Pope’s interview, if anyone really bothered to discover since it’s of little news value, is that the statement was made in reaction to questions about the Vatican Bank scandal, the questionable past exploits of the bank officer who was involved in the aforementioned saga and a particular clandestine gay lobby working within the Curia. The entire quotation is certainly more sedated and may not rate as something sensational enough to be published. Here it is: “There’s a lot of talk about the gay lobby, but I’ve never seen it on the Vatican ID card. When I meet a gay person, I have to distinguish between their being gay and being part of a lobby. If they accept the Lord and have goodwill, who am I to judge them? They shouldn’t be marginalised. The tendency is not the problem … they’re our brothers.” Now, if anyone also took the trouble to research Catholic moral teaching on the issue, they would discover that the Pope merely resonated the Church’s position on the matter – homosexual acts, just like any other acts against chastity, is sinful. But that doesn’t mean that someone who has homosexual orientation or tendency is evil. In fact, the Church advocates special pastoral care and support to be given to those who struggle with this orientation. A person with a homosexual orientation, just as someone who has a heterosexual orientation, is equally called to a Christian life of purity and chastity. It’s funny how the phrase “who am I to judge” and its derivation, “don’t judge me,” have become an over-used defence that validates every sort of behaviour and excuses us from being accountable to moral truths. The injunction can never be an approbation of sinful behaviour. In fact, charity demands that we speak out against evil and sin, and when we do so, we are really showing love of our neighbour and a concern for their soul. In fact, it is a lack of charity when sin is ignored. But, then how do we understand Jesus when he tells us not to judge? “Judge not, and you will not be judged; condemn not and you will not be condemned; forgive and you will be forgiven.” Well, today’s feast provides us with the answer. To judge in the manner of condemning others would be tantamount to usurping the authority of God and Christ. It is Christ who stands as Judge over us and not we who act as judges over others or even God. The divine power to judge each and every person belongs to the Son of Man. The Church year closes with a description of Christ’s last judgment. Christ is indeed the King of the universe, as he sits triumphantly on his throne of glory, but Christ is also its Judge. 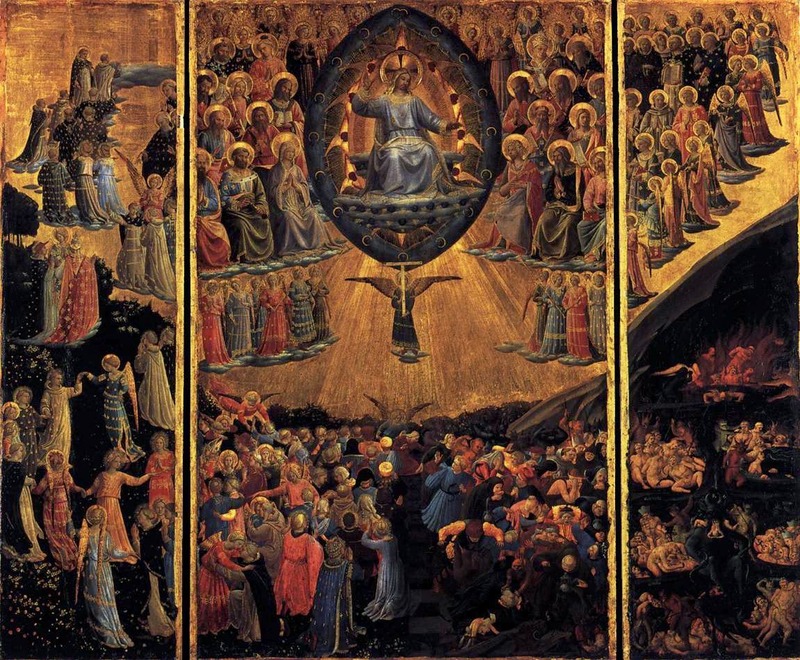 We see two themes interwoven into this magnificent scene of the Final Judgment. The first and central theme is that everything we do or do not do to the least of our brethren is done or not done to him. The second theme is also found in the same place: if the first theme is the absolute criterion, then those who undergo judgment must be completely separated into right and left, eternal reward and eternal punishment. The final judgment is not just for show, where everyone will receive the same sentence of a general acquittal and all be admitted to heaven, a popularly held belief. There will be judgment and sentencing. Our actions in this life will ultimately determine our final fate – we will reap what we have sown. But the interesting thing about this parable of judgment is that the second theme depends on the first, which provides the decisive teaching given by the entire tableau: the judging, glorious King shows his solidarity with the least of his brothers. Christ unites himself with the hungry, the thirsty, with aliens and the homeless, with the unclothed, the sick and the imprisoned. And here lies the irony, a truth that we should ponder constantly: in the most miserable of our fellow men we have already met our Judge. Therefore, today’s gospel provides the criteria by which the eschatological judge will formulate his verdict. And the ultimate criterion of his judgment will be love, active love, overflowing into simple deeds of goodness and charity. The works of charity in regard to one's neighbour are a fundamental element of the judgment. Christ identifies himself precisely with this neighbour. The small, routine, and seemingly insignificant deeds we do to our neighbour have profound ramifications of eternal proportions for us, and upon these shall we be separated sheep from goats. From the gospel we learn that it is not by earth-shaking deeds or headline making activities. Simple and often obscure acts of love, of which anyone, at anytime, is capable, are the deeds which wield his power in time and space. A frightening and yet challenging thought remains with us from today’s gospel: those who were condemned to eternal punishment were separated from the just, not for dastardly deeds or heinous crimes, but for the little acts of love they had neglected to do. In failing to feed the hungry, visit the imprisoned, provide consoling support to the sick, they had summarily rejected not only their king and his reign but their own inheritance of salvation as well. And certainly the failure to correct our brother when he errs must surely count as not just as being polite and non-judgmental, but really a neglect of charity. We can even hear a modern paraphrase that could sound like this, “where were you when I needed correction and direction to be led back to the path of repentance?” And so while we still enjoy the mercy of time, we can and should awaken ourselves and others to the presence of Christ’s reign and seek out the message of need in the faces of the poor, the downtrodden and the lost. In so doing, we shall discover the power of our king and establish his reign of peace and love. Christ is not only our Judge, he is most certainly our Saviour. This is manifested in the whole messianic mission of Christ. Christ does not regard it as his mission to condemn people. He is, first of all, the one who teaches the way of salvation, and not the accuser of the guilty. The nature of divine judgment must therefore be seen in the rejection of Christ’s mission. In the presence of the Light of the World, in the presence of one who is the Way, the Truth and the Life, each one is judged by one's own deeds. Man condemns himself when he rejects the possibility of salvation offered to him. In today’s gospel, Christ offers that possibility by teaching us that acts of love would be certain path to salvation. When we refuse to love, when we ignore the needs of others, when we remain silent where we are under duty to speak, when we choose to please our brother by approving his sinful actions, we have already signed our own death warrant.